Write Now Right Now-The Blog-Cause: An Engaging Cause and Effect Lesson Effect: Students Engaged, Learning and No Papers to Grade! Cause: An Engaging Cause and Effect Lesson Effect: Students Engaged, Learning and No Papers to Grade! I was recently in a 5th grade classroom where the students were just starting to delve into the concept of cause and effect. The focus of the lesson was to provide students with strategies to help them correctly identify cause and effect relationships in text. When asked what they already knew about this skill, students could explain that the two concepts were linked to one another, and that one action led to another. To begin the lesson, students created a two-column chart. The left side of the chart was titled Cause and the right side of the chart was titled Effect. We then read the 5th graders the picture book If You Give a Cat a Cupcake by Laura Numeroff. https://www.amazon.com/You-Give-Cat-Cupcake-Books/dp/0060283246 Fifth graders love the opportunity to listen to picture books and they were enthralled with the story. While reading the book, I slowly moved around the room. As I was walking and reading, these older students were whipping around in their seats, following me with their eyes as they intently listened to the simple story. We first read the book for the sheer enjoyment of listening to the story. During the second reading, the students and I were looking for cause and effect relationships. As we found a cause, we would write it on our chart, followed by the effect of this action. The students quickly noticed that the cause must come first, as it is the catalyst for the effect. The next step was for students to create an anchor chart to keep in their Reading and Writing Folders. Completed with the students, this chart included the definition of cause and effect, examples, and key words they might find in the text when looking for cause and effect. When students are a part of creating an anchor chart, the information becomes relevant and useful to them. Students then browsed other If you Give…books and created a second cause and effect chart independently. Students were engaged in their reading and thrilled to be able to find cause and effect relationships throughout the new books. The classroom teacher and I wanted to complete a quick formative assessment to see who required extra support on this skill. 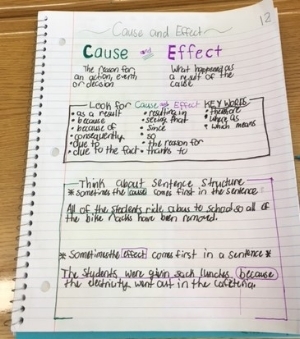 Each student took a quarter sheet of paper and in the corner of one side wrote “Cause.” In the opposite corner, students wrote “Effect.” Students could choose to either write a Cause or Effect sentence in the appropriate corner. They then exchanged their paper with another student in the class, who wrote the relating sentence. For example: A student wrote: Cause: Tom Brady threw an interception in the last minute of the game. His partner then wrote Effect: Tom’s team lost the game to the Denver Broncos. Another student wrote: Effect: The vegetables in the garden were destroyed. His partner wrote: Cause: Grandpa forgot to lock the gate on the sheep pen. Student partners shared their sentences. As they shared, their teacher took notes on only those students she felt needed extra instruction. The following day she planned to meet with those students during a small group instruction time. All students whose name she had not written down received a passing grade on this assignment. Within a 15 minute assessment period, the teacher had given every student an assessment and knew who needed additional support. More importantly, the students had personally interacted with the concept of Cause and Effect and solidified their learning through the creation of an anchor chart. The students had mastered a reading and writing concept and the teacher was not taking home a stack of papers to grade! Older PostWould You Do It Again?